I came up with the idea for these Reindeer Brownie Bites when I was making the Turkey Oreo Cookie Balls. The Oreo Cookie Balls are no bake, but they take a bit of work. You have to shape them, chill them, dip them and then decorate them. I started thinking about what else I could decorate and came up with brownie bites! 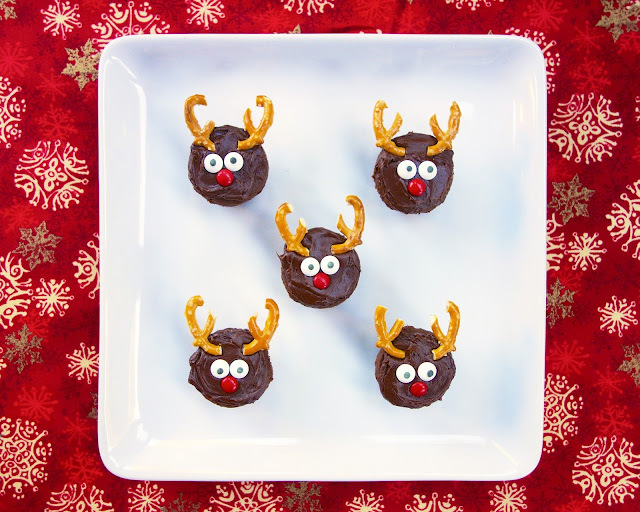 I used some store-bought brownie bites and decorated them like Rudolph the Red Nosed Reindeer (my favorite Christmas claymation). The hardest part of these brownies is cutting the pretzels in half. Several broke and were unusable. Overall these are super easy and adorable. I will be taking these to any and all parties I am invited to! Invite me, please! I am dying over these cuties! Cut mini pretzel twists in half with knife. Frost brownies with chocolate frosting. Top with candy eyes, red M&M and pretzel halves. Stephanie these are so cute! These are absolutely perfect for my preschoolers class Christmas party! The kids will love them! These are so cute! I love those pretzel antlers! These are awesome! Where do you find the candy eyes? you can get the eyes at Walmart or Michael's in the cake decorating section. Those are so cute. The antlers are just perfect :).